In this tutorial you will use UMEP to answer a research question. The research question can be answered using SUEWS within the UMEP plugin. We will go through each of the steps necessary to prepare, run and analyse the model output. Research question: What is the difference in sensible heat flux between a summer with a large number of heat wave days and a low number of heat wave days in Beijing, China? Make sure the following python packages are installed: numpy, matplotlib and pandas. Start the WATCH-plugin (UMEP > Pee-Processor > Meteorological Data > Download data (WATCH)). If a message pops up that libaraies are missing, follow this link,. Download and load the LCZ map from Beijing, available from the WUDAPT portal. Download data (WATCH): Download data for the selected years. Vector grid: Make a vector grid at the resolution for which you would like to run LQF and SUEWS. 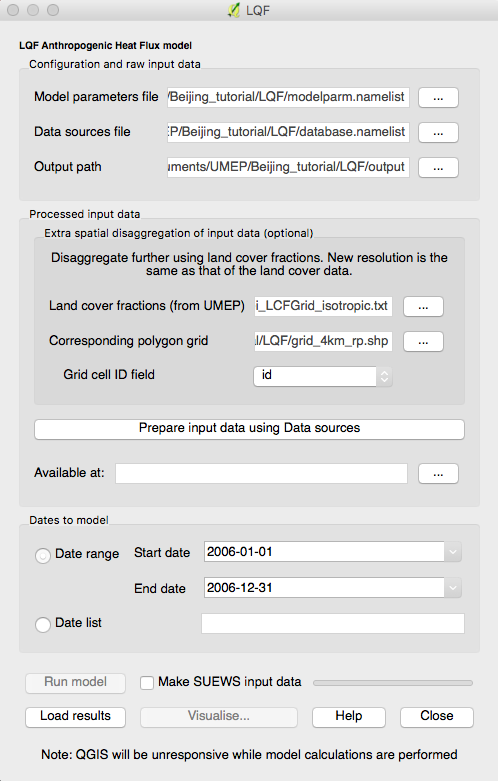 LCZ converter: Convert Beijings LCZ map into morphometric parameters and Land cover fractions. 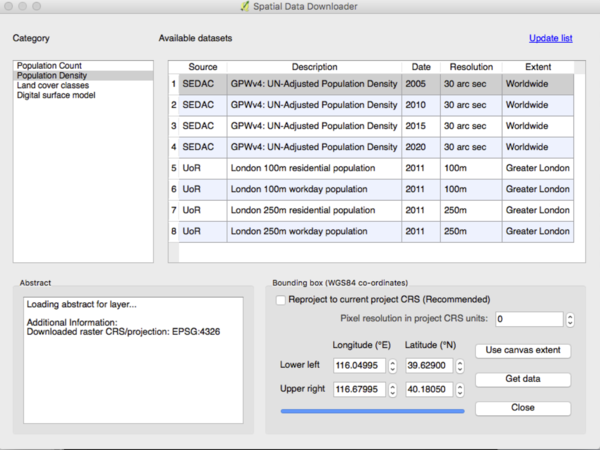 Spatial downloader: Downloads maps of population count and density. LQF: Compute anthropogenic heat fluxes. SUEWS: Calculates the energy balance. Benchmark: Compares results of different runs. SUEWS analyser: Displays the output for one single run. Open extreme finder at UMEP > Processer > Outdoor Themal Comfort > ExtremeFinder. Manually enter coordinates of the location you are interested in, or click fetch coordinates from map canvas. 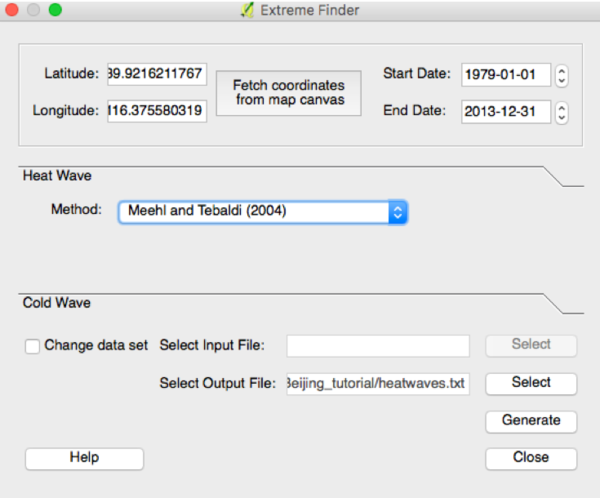 Select a period over which you would like to identify heat waves at Start Date and End Date. Select a place and name for the output file. Plots of maximum temperature, number of heat wave days, and box plots of the maximum temperature of heat wave days over the selected year should appear. We choose 2009 as a year with a heat wave, due to the long heat wave event at the end of June/start July. On the other hand, 2006 was selected as a non-heat wave year. Open the WATCH data downloader at UMEP > Pre-Processer > Meteorological Data > Download Data (WATCH). Click on Fetch coordinates from map canvas and click in the centre of the LCZ map, this will make the chosen coordinates show up on in the Latitude and Longitude boxes. Specify the hours offset from UTC, for Beijing this is 8. Specify the terrain height of the chosen coordinates. In the centre of Beijing this is about 50 meters. Under Compressed source data specify a folder where the data should be downloaded. Leave Path to the AH results (optional) blank for now. At Extract data to specify the meteorological data text file. This will take some minutes if you are downloading a year. Finally, you should have a text file with the meteorological data and netcdf files of each of the individual variables (Incoming shortwave and longwave radiation, pressure, rain, temperature and humidity). Open vector grid at Vector > Research Tools > Vector grid. Select the extend of your LCZ map by clicking the … next to Grid extent (xmin, xmax, ymin, ymax) and select Use layer/canvas extent. Specify the desired grid spacing, depending on the projection this will either be in meters or in degrees! Make sure the output is in polygons, not lines. Save the grid to a new layer. 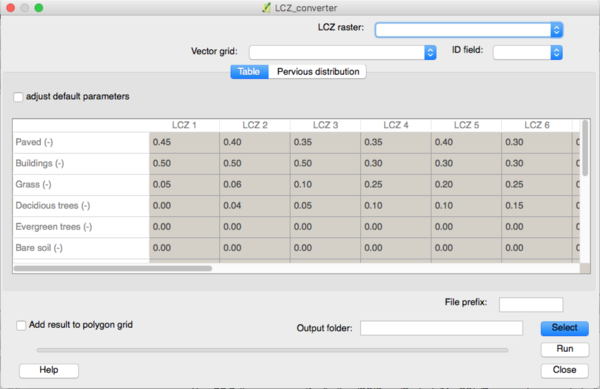 Open the LCZ converter at UMEP > Pre-Processer > Spatial data > LCZ converter. Select the LCZ raster layer at ‘’ LCZ raster’‘. 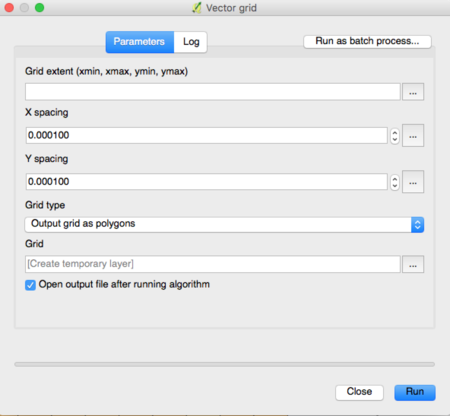 Select the vector grid you have just created in step 3 at Vector grid and select the ID field of the polygon grid at ID field. By clicking Adjust default parameters you can edit the table. This table specifies the pervious, trees, grass, etc. fractions for each of the LCZ classes. For more information about each of the classes see LCZConverter. If you choose to edit the table, make sure all fractions add up to 1.0. Now you can select your best estimate about the distribution of the pervious surface fractions for urban and the tree distribution for rural. In addition, also specify the expected height of the trees. Once you are satisfied click Update Table. Select add results to polygon. Add a file prefix if desired. Finally select an output folder where you would like to receive the text files and click Run. This should generate 3 text files, one with the land cover fractions, one with morphometric parameters for buildings and one for trees for each grid cell of the polygon grid. In order to run LQF you will need population counts for each of the grid cells you are modelling. 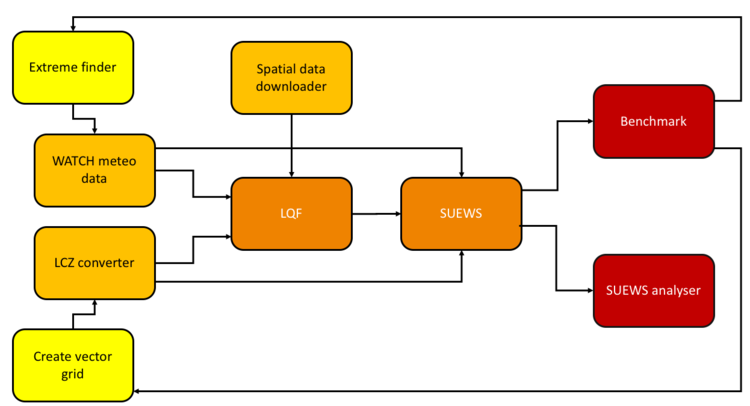 Open de spatial downloader at UMEP > Pre-Processer > Spatial data > Spatial Data Downloader. Select population density and select the GPWv4: UN-Adjusted Population Density closest to the year you intend to model. Right-mouse click on your vector grid and click Open Attribute Table. Click the abacus shaped symbol this is the Field calculator. Under Output field name write “Pop, the Output field type should be “Decimal number (real)”, and the Output Precision can be set to 2. In the expression dialog box write popdens*$area/1000000, here popdens is the name of your population density field, $area is the size of the area for each grid cell and the 1 000 000 is to convert the data from m2 to ha. Click OK and you should have a new field called “Pop”. Before running LQf, you will need to prepare some of the data required to run it. Convert the hourly temperatures you downloaded in step 2 into daily averaged temperatures in Excel, or a programming language of your choice. Prepare the database.nml and the modelparm.nml as written in the manual. Make sure you change timezone, use_uk_holidays, use_custom_holidays and custom_holidays in modelparm.nml. Open LQf at: UMEP > Processer > Urban Energy Balance > Anthropogenic Heat LQf (LUCY). Select the locations of the created modelparm.nml and database.nml and the folder you would to save the output to. The extra disaggregation of the input data is optional, but the user could specify the land cover fractions generated in step 4 and the vector grid. Click Prepare input data using Data sources. This may take a minute. Once this first process has finished specify the Date range Start date and End date. Click Run model and the model will take a while to run. If you are simulating an entire year this process may take a few hours. Finally you should have csv files of anthropogenic heat fluxes for each hour in the date range and for each grid cell of the vector grid. Under *Path to the AH results (optional)* specify the folder the results from step 6 are saved to. Before running SUEWS, you will need to prepare some of the data required to run it. Open SUEWS prepare at: UMEP > Pre-Processer > SUEWS prepare. Under vector polygon grid specify your created vector grid and the ID field. Select the location of the Meteorological file from step 2, the Building morphology, Tree morphology and Land cover fractions from step 4 and the population density from step 5. Enter the start and end of day light savings time and the UTC offset. Specify the Leaf cycle = winter when initialising in January. Unless the user has better information initialise the Soil moisture state at 100 %. Select an output folder where the initial data to run SUEWS should be saved and press Generate. When using LQf output as input for SUEWS there will be different meteorological file for each grid cell of the vector grid. these files all need to be renamed to the following format be7_2006_data_60.txt, where 7 is the number of the grid cell. Rename all meteorological files to this format. Open SUEWS at UMEP > Processer > Urban Energy Balance > Urban Energy Balance (SUEWS/BLUEWS, advanced). 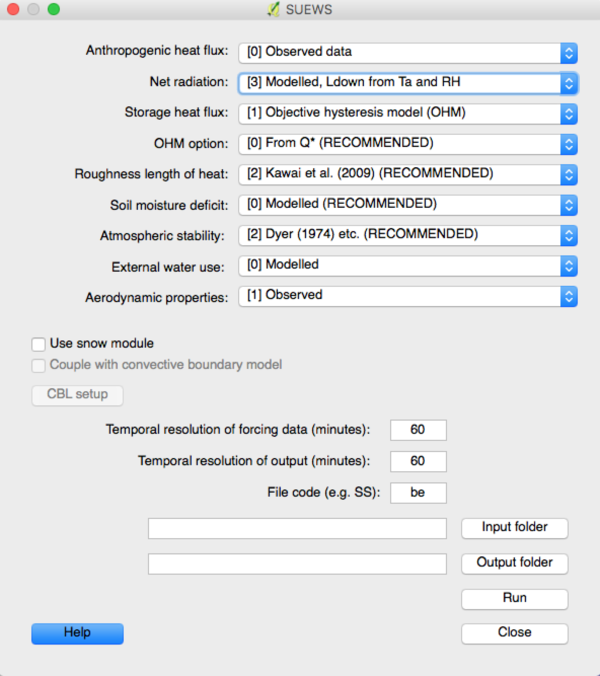 For the Anthropogenic heat flux, select option “ Observed data”. Feel free to change any other options. Specify the Temporal resolution of forcing data (minutes) to be 60 minutes. Specify the Temporal resolution of output (minutes) to be 60 minutes. Select the Input folder specified in SUEWS prepare and select an output folder for the SUEWS output to be saved in. Finally, click Run. This process will take several hours dependent how many grid cells are used in the simulation. If the simulation is successful the output folder will contain txt files with SUEWS output for each of the grid cells in the vector grid. This system allows for comparison of runs with observed data. Open the Benchmarking system at: UMEP > Post-Processer > Benchmarking system. 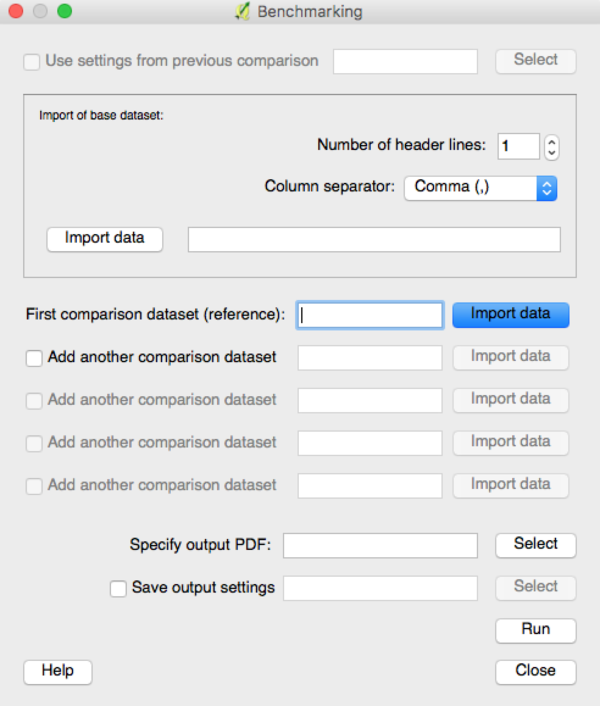 Select the First comparison dataset (reference) by pressing Import data’ and importing the default SUEWS run at the location of the observations loaded in the previous step. It is possible to load another dataset by checking Add another comparison dataset and selecting another SUEWS run or a different grid cell. Once you have selected the appropriate datasets create a PDF at Specify output PDF and pressing Run. This should generate a PDF of statistics for each variable with the overall performance score, the mean absolute error, mean bias error and the root mean squared error. This system allows for plotting of SUEWS output. 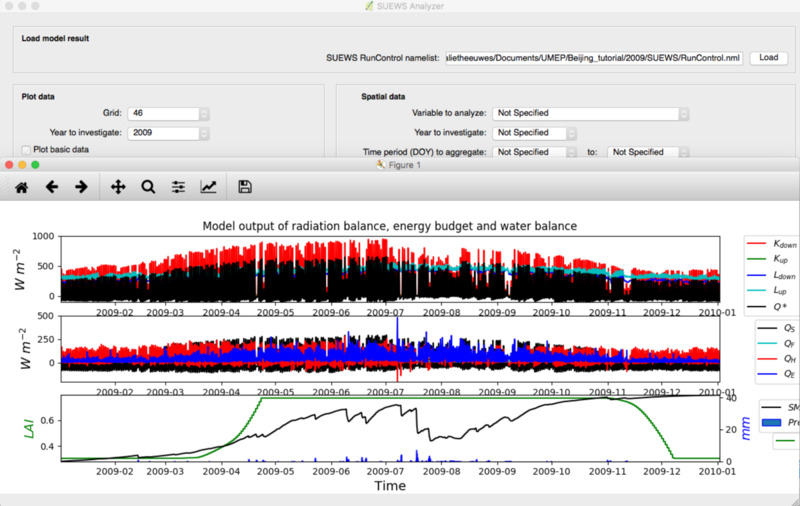 Open the SUEWS analyser at: UMEP > Post-Processer > Urban Energy Balance > SUEWS analyser. Plot some of the basic data, such as the radiation and energy balance and the soil moisture and precipitation by selecting a grid cell on the upper left hand side. In addition select the Year to investigate. Check the box Plot basic data and press Plot. This should create a plot comparable to that in the screenshot above. On the right-hand side of the dialog select “Sensible heat flux” at Variable to analyse. Select the Year to investigate and the days of the year. June is DOY 152 - 181. Select Average and Only daytime. Finally select the vector grid created in step 3 and ID field at Vector polygon grid used in the SUEWS model, check Add result to polygon grid and click Generate. This should generate an additional field in the attribute table of your vector grid. If it does not show up in the attribute table, reopen the vector grid. In order to visualise the mean June daytime sensible heat flux, right click the vector grid in the layer panel and select Properties.